Secret Bay, Dominica – August 1, 2011 — Secret Bay, a newly constructed boutique property that embodies minimalist chic and eco-luxury, is now open on the pristine nature island of Dominica. Demand is already high, with owners, couple Gregor Nassief and Sandra Vivas, having welcomed approximately a dozen guests since the resort’s June 2011 debut. Situated on a cliff-top overlooking the Caribbean Sea, Secret Bay appeals to the discerning traveler with four exquisite villas and bungalows that provide a distinctive getaway experience. Secluded villas encompass a spacious 2,500 square feet and include a large open verandah that’s ideal for enjoying the breathtaking views of the Caribbean and mountains. High ceilings and abundant windows allow for plenty of natural light to enter during the day. Each villa is also outfitted with an indoor/outdoor living room, bedrooms with en-suite bathrooms that feature free-standing tubs and dual vanities, fully-equipped modern kitchen, private pool or jacuzzi and pool deck, outdoor shower, hammock and fine linens. High speed Wi-Fi, a Kindle with daily international newspapers, a state-of-the-art A/V system with iPod dock, Cable TV with DVD player and a personal library of books, music, board games and DVDs are standard in every villa and bungalow. Two-story bungalows have most of the features of the villas and the same aura of exclusivity. Additional villas are planned for later phases of development. Distinctive services offered by this villa-style hotel include a full-time attendant and cook, organic food baskets and pre-stocked locally-grown foods all in the comfort and seclusion of the guest’s accommodations. A concierge is ready to see to any need and the property’s air-conditioned ATV and driver are available for day excursions. Further, guests are treated to a complimentary welcome dinner upon arrival, the beginning of the VIP experience. Secret Bay expects to attract honeymooners and couples seeking a romantic getaway as well as individuals looking for a rejuvenating long-term break. Rental of the whole property is also possible (with accommodation for up to 10 people) for an intimate gathering of family and friends. As the villas at Secret Bay are also available to purchase either fully or through a fractional ownership scheme, this is an excellent opportunity to own prime real estate in the undiscovered Caribbean. Located on the northwest coast of Dominica, this boutique eco-luxury development is just a ten-minute drive to the quaint town of Portsmouth and one-hour’s drive to the capital Roseau. The secluded villas and bungalows for purchase or rent were designed by award-winning Latin American architect Fruto Vivas, to maximise the natural beauty of Secret Bay and to minimise the impact on this pristine environment. Secret Bay is a sustainable development – from the sourcing of the materials, the building methods, water and energy efficiency, to an ongoing commitment to the protection of this precious land. Secret Bay also supports the local community through employment, the development of small-scale tourism in the area and setting-up a Community Development Fund. In a region saturated by tourism, Dominica remains one of the hidden gems of the Caribbean. It is dubbed the “Nature Island” due to its abundance of natural splendours: 365 rivers, the second largest boiling lake in the world, a lush rainforest, volcanoes, mountains, waterfalls, hot springs, and black and white sand beaches. Much of the island is protected under national parks, one of which has been given UNESCO World Heritage status. Dominica is a paradise for divers, hikers, birdwatchers and nature-lovers. Despite being one of the largest islands in the Caribbean (754 sq. km), it is one of the least populated (72,660) (twice the size of Barbados, it only has one fifth of its population). It is also one of the few islands to have retained some of its pre-Colombian population. Roseau, Dominica – Discover Dominica Authority announced that effective October 19, 2010, WinAir will introduce new flights from Antigua to Dominica’s Canefield Airport, with nonstop flights three days each week. With Canefield Airport only a five minute’s drive to Roseau, the new routing will make travel to Dominica from Antigua more convenient for many travelers. “We are pleased that WinAir recognizes and has responded to the need for increased flights to and from Dominica. These new flights provide early morning and late afternoon departures each way, allowing travelers in Antigua and Dominica to make day trips between the two islands. Additionally, the late afternoon departure from Antigua affords Dominica bound passengers the opportunity to use Antigua as a connecting gateway, commented Mr. Colin Piper, Director of Tourism/CEO of Discover Dominica Authority. For reservations on WinAir, travelers from the United States should contact the booking center at 1-866-466-0410 begin_of_the_skype_highlighting 1-866-466-0410 end_of_the_skype_highlighting. For more information on Win Air, please visit www.fly-winair.com. Known as “the Nature Island” and located between the French islands of Guadeloupe and Martinique in the Eastern Caribbean, the independent nation of Dominica (pronounced “dom-in-eek-a”) is the largest and most mountainous of the Windward Islands, encompassing an area of nearly 290 square miles. Of volcanic origins with mountains reaching heights of nearly 5,000 feet, rainforests that are considered among the last true oceanic rainforests in the world, more than 365 rivers, waterfalls the second largest Boiling Lake in the world and pristine coral reefs, Dominica’s natural diversity is truly unique. Dominica is also home to the last remaining settlement of Indigenous People of the Caribbean – The Carib Indians. A place where man and nature live in harmony, adventurers and nature lovers alike will revel in the Island’s eco-tourism options which include scuba diving, snorkeling, mountain biking, kayaking, horseback riding, nature tours, hiking/trekking, whale, dolphin and bird watching, sailing and fishing. For more information on Dominica, contact Discover Dominica Authority at 866-522-4057 begin_of_the_skype_highlighting 866-522-4057 end_of_the_skype_highlighting. Or, visit Dominica’s official website: www.discoverdominica.com or follow Dominica on Twitter and Facebook. Activities will begin at 10:00 am and all races will be held on Segments 4 and 5 of the WNT, covering the community of Sylvania and the Emerald Pool. Following the competitions, activities will be held within Sylvania. For more information on Dominica, contact Discover Dominica Authority at 866-522-4057 begin_of_the_skype_highlighting 866-522-4057 end_of_the_skype_highlighting. Or, visit Dominica’s official website: www.discoverdominica.com or follow Dominica on Twitter, YouTube and Facebook. Roseau, Dominica – Discover Dominica Authority announced that WinAir has resumed their service between major Caribbean hubs and Dominica, making it easier for travelers to visit the destination. The regional airports servicing the flights to Dominica’s Melville Hall Airport (DOM) are St. Lucia’s George F L Charles Airport (SLU) and St. Maarten (SXM). For reservations on WinAir, travelers from the United States should contact the booking center at 1-866-466-0410 1-866-466-0410 . For more information on Win Air, please visit www.fly-winair.com. For more information on Dominica, contact Discover Dominica Authority at 866-522-4057 866-522-4057 . Or, visit Dominica’s official website: www.discoverdominica.com or follow Dominica on Twitter and Facebook. Roseau, Dominica – (June 10, 2010) – Jah Cure, one of reggae’s most revered voices and artists will be among the acts performing at Dominica’s 14th Annual World Creole Music Festival, which will take place October 29 – 31, 2010. Highly anticipated by fans of this style of music throughout the world, the 14th Annual World Creole Music Festival will be held October 29 – 31, 2010. A well-established Caribbean and international platform for artists of the genre, the festival is widely seen as one of the only truly indigenous music events in the Caribbean. Over the years, the festival has attracted some of the most renowned musical groups and soloists from the Creole-speaking World. Past performances included premier acts such as Exile One, Kassav, Gramacks/New Generations, Tabou Combo, Swinging Stars, La Perfecta and others as well as solo artists like Sean Paul, Ophelia, Tania St. Valle, Sakis, Franky Vincent, Sweet Mickey and Maxi Priest. For more information visit www.wcmfdominica.com. Dominica continues to be recognized for its attributes and responsible tourism efforts, including being the first country in the world to receive Benchmarking designation from the prestigious eco-tourism organization Green Globe 21. National Geographic’s Center for Sustainable Destination ranked the island as the top sustainable island in the Caribbean and among the top ten in the world. 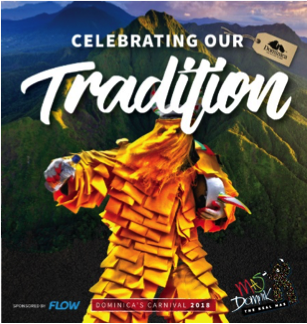 Dominica was recognized by Islands Magazine and was included in its 2007 Blue List for being a leader in responsible tourism and ensuring an environmentally and culturally sound island for future generations. Travel + Leisure also announced Dominica as one of the most compelling destinations to visit in their 100 Greatest Trips 2008 edition. Most recently, Dominica was recognized as the 2nd most “pure island” in the world in the April/May 2010 issue of Islands Magazine.